If you happen to be driving east along Highway 50 in the Sierra Nevada Mountains, keep an eye out as you approach the town of South Lake Tahoe. Look carefully to your left a few yards before the entrance to the local airport and you may catch a glimpse of an improbable sight: a faded fleet of decomissioned San Francisco streetcars resting in the high alpine snowdrifts almost 200 miles from the city where they once carried passengers. 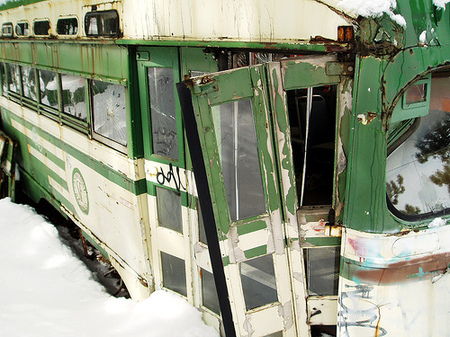 How did these streetcars end up so far from home? The story turns out to be an only-in-California mixture of romantic fantasy and radical idealism, and it begins during the early 1980s, when Muni, San Francisco's public transit agency, decided to retire the last of it's streamlined "Presidents' Conference Committee" streetcars. The unusual name comes from the fact that the car was designed by a committee, formed in 1929, representing various electric street railways. The Electric Railway Presidents' Conference Committee, or ERPCC, was tasked with producing a new type of streetcar that would help fend off competition from automobiles. The committee produced a high-performance design that was commonly used in the following decades. The cars were popular because of their distinctive streamlined design and smooth acceleration. 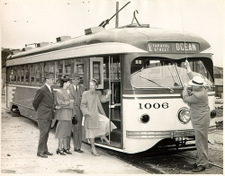 PCC streetcars were manufactured from 1936 to 1952, and ultimately almost 5000 were built. San Francisco operated a fleet purchased during the 1940s, but four decades later, the cars were worn and tired, and they looked ridiculous when painted in Muni's Disco-era "rainbow" livery. By 1982, Muni had acquired a modern fleet of "Light Rail Vehicles" from Boeing, the last of San Francisco's PCCs was finally removed from service, and a few of the old streetcars were sold off to the highest bidder. The highest bidder turned out to be a man named Gunnar Henrioulle. My hands on steam engine credentials are limited to some work with Hal Wilmunder's Antelope & Western in 1960. On a dare, I stole a ride on SP 4460 from Palo Alto to 3rd & Townsend in July 1957. Only cab ride on big steam at speed. Got in trouble...After that I was with CalDWR- Water Resources. Then Aviation Maintenance, Pupil Transportation, and some railway experience, passed the Railway Rules Test (GCOR) and am presently working on rail transportation planning issues on the US50 Corridor between Sacramento, CA and Reno NV. 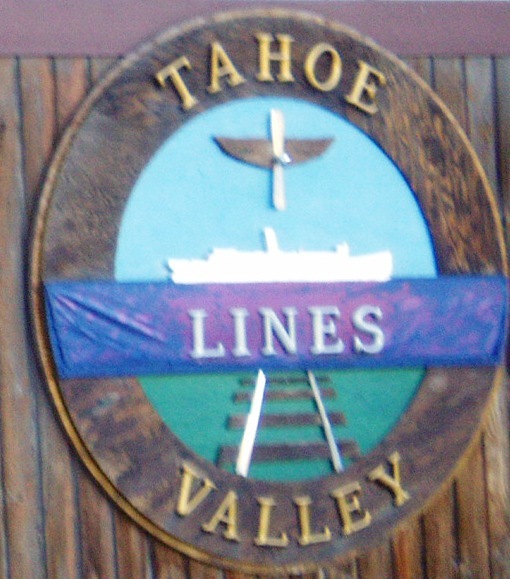 Please see "Tahoe Valley Lines Mission Statement" in MASS TRANSIT MAGAZINE, 11-04, P.70. (Cygnus Publications). Former member High Speed Rail Association, American Public Transit Association. 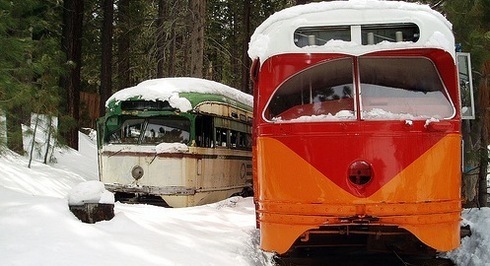 In South Lake Tahoe, Ca., TAHOE VALLEY LINES is proposing to use a dozen rehabbed electric PCC Trolley Cars, circa 1945, to form the basis of a sustainable energy (solar & Hydro) public transit system. 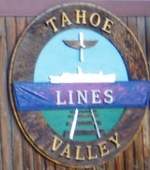 The track route would link the Airport (TVL) users, such as Virgin Atlantic (one possible airline) with resorts at Stateline, NV., and waterborne service on big blue Lake Tahoe. The system route would be engineered to be part of a future electric railway along the American River corridor from Sacramento/Placerville, which would run on to Carson Valley & Reno, NV. The railway would junction near Strawberry Lodge, with the Lake Tahoe Line running thru a five-mile tunnel to the Tahoe Valley floor, with the main passenger/freight route using a 15+ mile bore to access the Carson Valley near Genoa, NV. This is compatible with existing demographics, not to mention projected growth. The intercity railway will gain momentum with the inexorable constricting of surface transport with the onset of peaking oil, and the necessity to move more freight trans-Sierra via rail, as well as the growth in passenger numbers. The existing Sierra rail crossings will be inadequate to meet the growth in traffic, and are slow running as well. The 1869 & 1909 rail line capacity will be severely strained as the effects of oil depletion take hold, and shall prove inadequate; hence the US50/American River (HydroPower at hand) rail crossing is requisite. This brings us more or less to the present day. While the exact status of Mr. Henrioulle's plan remains unknown, we assume it remains little changed and perpetually ongoing. To increase liquidity, he recently sold four PCC cars back to San Francisco for use on the city's restored F Market line, while San Diego acquired two in January 2006. The rest of the cars are still in the yard, and one of them, former San Francisco Muni streetcar No. 1127, can be photographed without trespassing significantly upon Mr. Henrioulle's property. Only Gunnar Henrioulle knows what it might look like tomorrow. One of our operatives received permission to photograph the Tahoe Valley Lines fleet during a full moon in May 2006. Check out Joe Reifer's amazing night photos. As a Telstar Logistics consultant, I did a survey of this site in May, 2006. Thanks to Telstar Logistics for the exciting site visit. Dr. Reifer, your photos ROCK. Nice! Mr. Henrioulle seems like a true visionary. ANYBODY WHO USES ALL-CAPS IS A VISIONARY. I enjoyed the story immensely. One could almost make a movie about this eccentric plan. 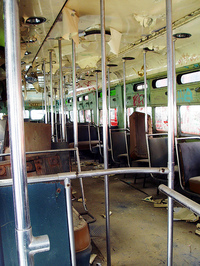 These photos of the old San Francisco trolleys are very nostalgic to me. We lived in SF from 1965 to 1971 and we rode those all the time. The N Judah car was "our" car. The City was a beautiful laid-back place then, no super tall buildings, no crazy traffic. The first apartment we lived in (with view of Alamo Square, a small fireplace, and a bay window) cost $65 a month. By 1974 the rents had increased ten-fold. I still miss that old San Francisco, before things were so coooool. Thanks for the nice pics. The 1101, protected only by a thin coat of graffiti, has survived the Angora fire. The first 1100, actually there never was a Number "1100"- waits for a individual or corporate sponsor and return to sevice. Maybe in San Fran, or St Louis. 1101 was also the first of the StL 1700's! The other streetcars remaining at Tahoe are the Toronto PCC #4404, and the "102435", a double-end streetcar fashioned from the front halves of MUNI "Baby Tens" PCC Cars #1024 & #1035. Handsome and looking well-proportioned at 56' in length, we hope to pursue the Tahoe Streetcar-waterborne transit link dream for at least another few years with a hybrid or Hydrogen Powered railcar. Maybe two, as we may redo the two Toronto PCC Cars likewise. The Casinos have maglev mania, they are a hopeless bunch. Some one, a Daddy Warbucks railfan out in dotcom America is looking for a meaningful legacy- renewable powered electric railways in and around Lake Tahoe. You, sir or madam, could do worse! See (peakoil.net) article 374, read several times for comprehension, and talk to your associates. I'm in the 'phone book. Indeed, I was tracking the status of the Lake Tahoe fire, and it did seem uncomfortably close to your property. Glad you all made it unscathed. Likewise, thanks for the update on your remaining rolling stock. I was wondering which cars remained. I enjoyed the story. I drive by there all the time and have wondered what was the plan for all those rail cars. I also notice they were being moved as of lately, thanks for the update. San Diego Vintage Trolley, Inc., bought three of these Lake Tahoe, ex-SF MUNI, streetcars. Numbers 1122, 1123 and 1170. Volunteers are presently trying to rebuild these three cars and put them in service on a "Circle Route" from the SD Trolley Yards, past the Convention Center to the Santa Fe Depot, thru downtown SD, City College and back to the trolley yards. The cars will use parts the SD trolley's Orange and Blue Lines to do this. We may have them in operation in late 2008 or early 2009. Wish us luck!! Log onto: http://www.sdvintagetrolley.com for more info. What a story. I have always been a PCC Steetcar junkie. It always bothered me seeing them sitting there rotting. I had a dream of aquiring one of them and, restoring it, and making a guest house out of it. Probably would have cost a few bucks to flatbed one to Florida! Always interested in hearing news of old streecars, especially the ol PCC'S. Avoid U.S. Customs ISF Penalties with Compliance-Trek! Huntington Beach, California - July 25, 2009 - Freightgate, a global industry leader in Web 2.0 technology supply chain software solutions, today announced that U.S. Customs and Border Protection (CBP) has published Penalty Mitigation Guidelines for ISF 10+2 Importer Security Filing Program. - Inaccurate submission of an ISF: CBP will issue a liquidated damages case in the amount of $5,000. - Late submission of an ISF: CBP will issue a liquidated damages case in the amount of $5,000. - Failure to withdraw an ISF: CBP will issue a liquidated damages case in the amount of $5,000. No liquidated damages will be assessed for the failure to file an ISF if no bond is in place. CBP will withhold the release or transfer of goods for which no ISF has been filed until all ISF information is received. CBP will also reserve the right to limit the permit to unlade goods for which no ISF has been filed and, if unladen, those goods may be subject to seizure. - Evidence of progress in implementing ISF compliance during the phase-in period. - A small number of violations compared to the number of ISFs. - C-TPAT Tier 3 and Tier 2 importers will receive consideration of up to 50% mitigation for violations. - The importer has demonstrated that remedial actions have been taken to address the circumstances surrounding the violation. - Late ISF filings due to circumstances beyond the importer's control. - Receiving incorrect information from another party or supply chain, if this information is found to be incorrect at a date later than allowed under the correction timeline. - Lack of cooperation with CBP. - Smuggling attempts and other actions contrary to law in association with the shipment. - Multiple errors on one ISF. - A rising error rate calculated over all ISFs. The mitigation guidelines become effective July 17, 2009. Freightgate’s Compliance-Trek! simplifies compliance with the U.S. Customs and Border Protection 10+2 Importer Security Filing ISF requirements. Re-usable templates eliminate redundant data entry by storing parties, items, HTSUS numbers and all other pertinent information. At the click of a button, the required data elements are transmitted directly to U.S. Customs and Border Protection CBP. Compliance-Trek! exclusive features makes secured information available to the people who need to know in real time with integrated RDV (Role Dependent View) technology. Compliance-Trek! is a stand-alone SaaS module of Freightgate's innovative PLTX platform which is easy to integrated into ERPs and other systems. Compliance-Trek! allows importers to file information from any worldwide location providing end-to-end supply chain visibility and close collaboration with suppliers, forwarders, customs brokers and ocean vessel carriers avoiding penalties and shipment delays. Test-Drive Compliance-Trek! today. Contact Freightgate on the web at www.freightgate.com , email sales@freightgate.com or call (714) 799-2833. Based in Huntington Beach, California, the Freightgate team has been developing Internet solutions for the freight and logistics since 1994, such as its industry-leading PLTX(tm) Platform, with I-Trek! (R) Internet Supply Chain Collaboration & Visibility; GTM-Trek! (tm) for RFQ and tender management; Tariff-Trek! (tm) for service contract and quote management; FMC-Trek! (tm) for fulfilling FMC publishing requirements; Pay-Trek! (tm) for automated freight bill audit and payment; WISA(tm) innovative What-If-Scenario Analysis tool; I-Sail! (tm) interactive online sailing schedule; Compliance-Trek! (tm) for compliance management with FMC and U.S. Customs. Freightgate's customer portfolio contains companies such as Alliance International, APL Logistics, CaroTrans, GeoLogistics (now Agility), Menlo Worldwide Logistics, Nippon Express, Panalpina, Primary Freight, Top Ocean, Dow Corning, Recylum, Screlec and Tembec. Freightgate is ISO 9001:2000 certified.